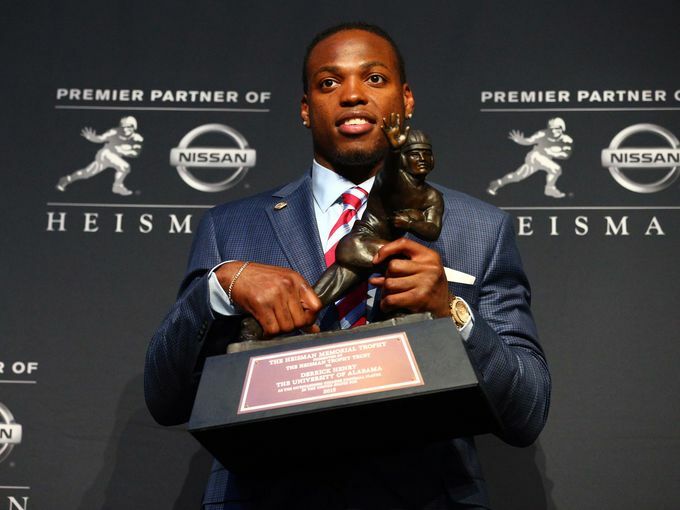 Saturday night Derrick Henry won the heisman trophy, one of the most prestiges awards in college football. A beast of a tailback with a large workload finished a junior season in which he rushed for an SEC-record 1,986 yards which was previously held by 1982 heisman winner Herschel Walker. Derrick also carried the ball 339 times and tied for a conference best 23 touchdowns. Henry finished with 1,832 points in voting beating Stanford running back Christian McCafrey who had 1,539 points. During Derrick’s genuine and utterly moving acceptance speech he spoke about growing up in Florida with teenage parents and the huge influence of his Grandmother who couldn’t make it to the heisman ceremony due to the fact she is hospitalized however Derrick said “She is here with me in spirit and I love her very much”. Derrick also gave tremendous appreciation to his teammates during his acceptance speech stating “Coming into Alabama from Florida, they all accepted me, they all loved me and all supported me,” he said. “And this season, they’ve seen me as a leader, taken me as a leader. The offensive line takes pride in controlling the line of scrimmage, making sure I have success, and through this year, looking at these guys, the courage they had in me, the faith they had in me, I knew I couldn’t let them down”. “Everybody always asks me about carries, what I thought about it, how I felt, but when you got teammates like that who love you and care for you, it don’t matter how you feel or how bad it hurts, you’ve got to make sure you’re making those guys happy by helping them win, getting a victory.” Derrick also took time to honor his late Alabama teammate Altee Tenpenny who died in a car crash two months ago. From here Derrick will be looking forward to the December 31st Cotton Bowl matchup between his Alabama Crimson Tide and the Michigan State Spartans to see who will get to the college football championship game and compete for a National Championship. Next Post: Kanye Speaks !